Can I add a gift registry to my invitation? Yes! You can add a link to your registry page(s) by using the Add a gift registry feature on the Invitation Options page. To access this option, head to the Invitation Options page click the Advanced Features tab. You'll then find the Add a gift registry option towards the bottom of the page. Turn this option ON, and then you'll be able to enter the URL for your registry. After you add the URL, simply click the Add button to include your registry on the invite. To access this option in the mobile app, head to your Invitation Options and tap on Show for the Advanced Features tab. You'll then find the Add a gift registry option towards the bottom of the list. Turn this ON, and then you'll be able to enter the URL for your registry. After you add the URL, simply click the Add button to include your registry on the invite. 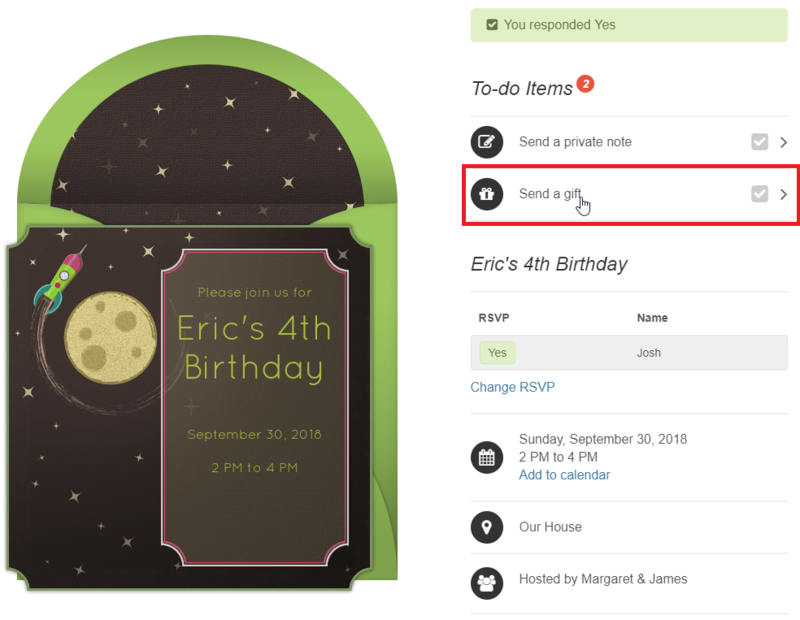 Guests will then be able to click the Send a gift option shown next to the invite to access your registry.